Last night Chris (the aforementioned “food-loving, Italian boyfriend”) and I went out on what was probably our first date night since Valentine’s Day. It was a beautiful spring Friday in New York City, the air taking on a pleasant warmth after a few days of sporadic rain, and it felt good to walk. We were both able to leave work before 7pm–a rare occurrence for either of us–and decided to head down to Bistango, an Italian restaurant on 29th and 3rd offering options for the gluten-free. Over the past few months, Chris and I have compiled a list of all the GF-friendly restaurants in the city that we could find, and this is the first one that we’ve been able to try. It’s difficult to find time to go out just the two of us. We both tend to work very long hours and are often too tired to even consider anything other than falling into the comfort of our apartment at the end of the day. That and we have a furry little baby waiting very patiently for us to come home, give her lots of hugs and kisses, and take her for a walk. And I suppose there’s also that pesky economy, the fact that eating at home is considerably cheaper, and that I enjoy cooking as much as I do. In any case, it felt especially wonderful to give ourselves an evening out together. Bistango is located amidst the pubs and cute, ecelctic dining spots that line 3rd Ave. The atmosphere is classy and inviting. Clean, white tablecloths contrast against the vibrant red walls and a series of contemporary, high-contrast portraits create a funky focal point. It was slightly windy at the time that we walked up, or we would have likely opted for two of the bright orange chairs on the sidewalk outside. Instead, we headed to the back of the restaurant and settled into the table closest to the kitchen. I felt a little uneasy at first–was I going to have to ask for the gluten-free menu? No, there was just one menu. At the bottom it noted that gluten-free pasta and bread was available. Okay, so what about the rest of the menu? The non-pasta dishes? Were they all gluten-free? I breathed and decided it best to ask our waiter. The only things on the menu that couldn’t be done GF: the stuffed pastas. Everything else was safe. We started the meal with bread. The waiter brought out regular bread for Chris and a piece of gluten-free french bread, split down the middle and slightly toasted for me. Also, two separate condiment dishes containing olive oil and minced garlic, to prevent cross-contamination. The bread was soft and crusty, and the garlic and oil was delicious. I’ll have to admit, as honestly as I’ve been okay with forgoing the pre-dinner bread basket, it felt nice to partake again. For the appetizer, we split the braised short ribs in a port wine reduction. The meat was exceptionally tender and the slightly sweet reduction beautifully offset its rich, beefy taste. Chris ordered the salmon as his main course (something that you can almost guarantee will happen if salmon is on the menu) with a side of spinach sauteed in garlic and oil. 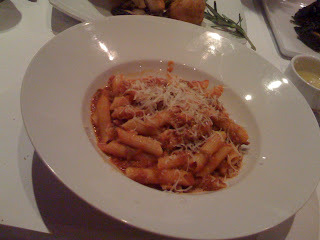 I ordered the penne in a slow-cooked beef ragu. This gluten-free pasta tasted, by far, the most like regular semolina of any GF pasta I’ve had to date. I was delighted to find thick threads of shredded beef in the flavorful orange-red sauce. It’s not often that I finish every bit of an entree, but I devoured every single piece of perfectly al dente pasta from this bowl. And I was ready for dessert. When the menu arrived the waiter began to say, “The only thing on the menu that we ca….” and I heard the rest of the sentence in my head before he finished it. The only thing we can do gluten-free is this, singling out the one thing for which they’d been able to create a GF option. To my complete surprise, he said, “The only thing on the menu that we can’t do gluten-free is this.” Really? Out of the maybe 6 or so options on the menu, only one couldn’t be done GF? 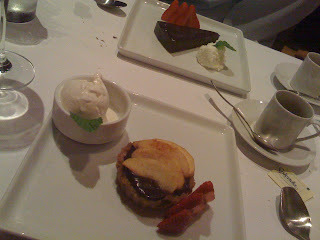 Well, one thing was for sure, I’d be coming back for dessert at the very least. And oh how I will. We each had a single espresso and Chris ordered the absolutely decadent flourless chocolate torte. I selected the apple tart, which offered up an unexpected combination of apple and chocolate in a cinnamon-flavored crust with a pleasant whole grain texture. Served alongside was a creamy vanilla gelatto that made me question how vanilla could ever mean anything but yum. Every piece of this meal was terrific, and the time and care put into making it safe for their GF patrons was apparent every step of the way. Never once did I feel like I was putting extra work on someone, creating frustration, or making a request that had a 50-50 chance of actually being honored. It was like asking for whole wheat instead of white or specifying that the dressing be put on the side. The waitstaff was knowledgeable and accommodating and thoroughly pleasant. Not to mention, everyone had a great sense of (and appreciation for) humor. After quipping back at the host, we looked up moments later to see him placing a glass of dessert wine–gratis–in front of each of us. The smoky, lightly sweet drink offered a hefty burn in the back of my throat that blossomed warmly under my tongue–a perfect finish to a splendid meal. We left the restaurant nearly two hours after we arrived, mellowed and warmed. The air had cooled slightly and we walked to the subway unhurried, enjoying the pre-summer scene–open restaurant fronts, sidewalk diners, easy laughter–reminded of why we love this city and the very many ways in which it feeds us.